There�s only one platformer game as challenging as Meat Boy and the name is I Wanna Be the Guy. The simple mention of the name is capable of leading grown men to tears � that�s just how hard that game is.And now we have I Wanna Be the Guy: The Mugen Fan Game, a long title which may be somewhat deceiving. 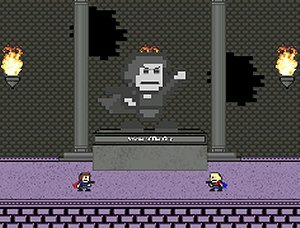 Those expecting a platformer will be disappointed, and those betting on a fighting game are correct, since the Mugen engine is used for fighting games, such Mortal Kombat, Dragon Ball or even Street Fighter Legends.The bosses we will encounter in this freeware action game are taken from the original I Wanna Be the Guy platformer. Players have to shoot the enemy as much as they can, while taking a look at the special powers available and always dodging the incoming attacks. A clever spin-off of a great game.